by Ricky Kreitner, Michael Schwartz, Lauren Silver, and Ellie Wall, and features articles on a wide variety of topics, all written by students in McGill’s Department of Jewish studies. The subjects include the figure of Ibn Falaquera and his philosophy, a study on the exemption of Ultra-Orthodox Jews from Israeli military service, a comparative analysis of two Yiddish short-stories, Jewish-American sexuality, and Walter Lippmann and his relationship to the broader Jewish community. The entire issue is currently available to read and download online here. We would also hope you check in with our blog regularly in the future for when this year’s volume is published as well, which took submissions recently. Student and faculty celebrating the Launch of the 2012 volume. 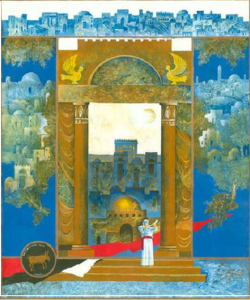 Published by mcgilljewishstudies on May 31, 2013 at 10:23 am under Uncategorized. 1 comment. 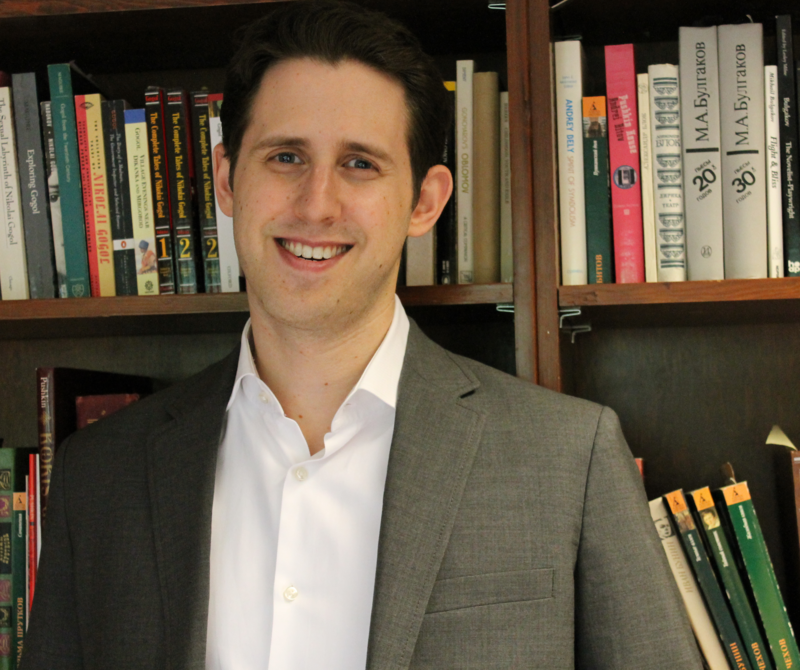 A recent graduate of Stanford University’s doctoral program in History, Daniel joins us from the University of Washington, where he was awarded the prestigious Hazel D. Cole Fellowship in Jewish Studies for the 2012-2013 academic year. His dissertation, “The Rise of the Zionist Right: Polish Jews and the Betar Youth Movement, 1922-1935,” explored the history of one of the largest and most influential Jewish youth movements to emerge in interwar Europe, and drew upon archival research across Poland, Israel and the United States. 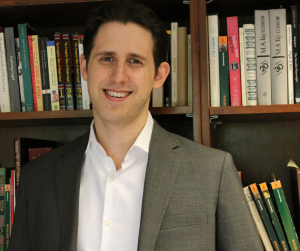 His current research interests include the role of youth in modern Jewish politics, the influence of Polish political culture on the development of Zionism in Mandate Palestine, and Jewish political activism in small-towns across Poland between the two world wars. Daniel’s award-winning research and writing have received recognition from the Mellon Foundation, the YIVO institute for Jewish Research, and the Memorial Foundation for Jewish Culture. While at Stanford, Daniel was also recognized for his teaching, where he he received the History Department’s award for best new course in 2011. Daniel is delighted to join McGill’s Department of Jewish Studies, and looks forward to teaching a range of courses on the history of Jews worldwide—from introductory surveys on modern Jewish politics, culture and society to seminars on Polish-Jewish Relations, the Holocaust and the history of Israel. Daniel will be teaching “Jewish History: 1000-2000” (HIST219) and the “History of Zionism” (JWST366) during the 2013-2014 academic year. Published by mcgilljewishstudies on May 26, 2013 at 12:31 pm under Uncategorized. 1 comment. As you may remember, last year, three Jewish Studies scholars were inducted into the Royal Society of Canada (one of which was our own Prof. Gershon Hundert). 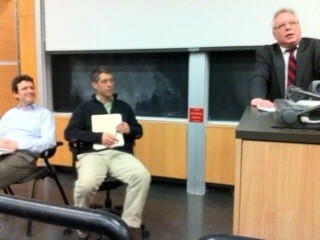 The three agreed to hold a conference on the state of Jewish Studies today in McGill, which Prof. Eric Caplan moderated. Here are some of the highlights of that conference. Enjoy. Published by mcgilljewishstudies on April 7, 2013 at 9:33 pm under Uncategorized. 0 comments. 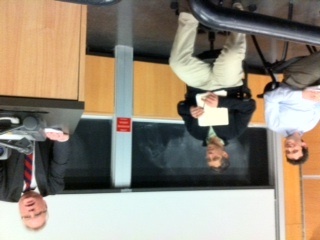 Last year, Mcgill hosted a panel with Allan Nadler, Carlos Fraenkel and Steve Nadler about Baruch Spinoza. After the panel, the three professors agreed to film a brief extension of their discussion and we now have a brief video showcasing some of the highlights of that discussion. 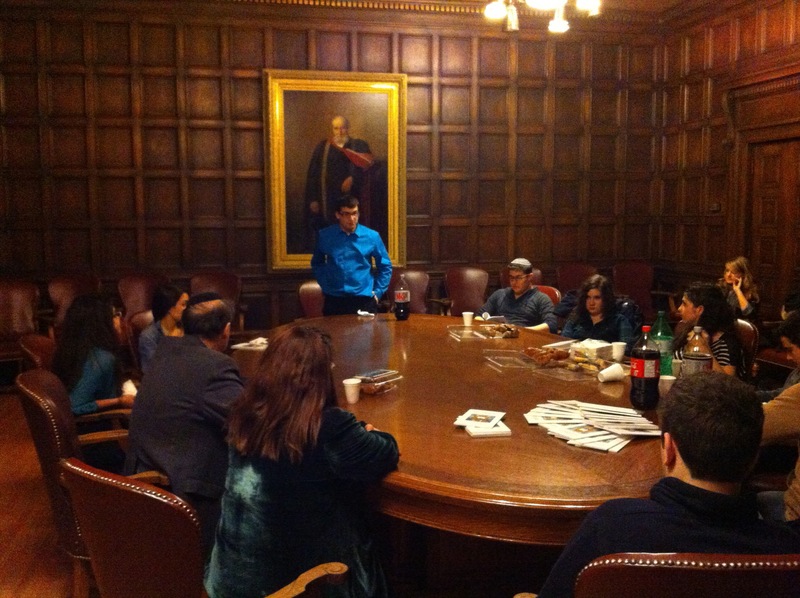 Published by mcgilljewishstudies on December 2, 2012 at 3:58 pm under Uncategorized. 0 comments. The examination of the Jew as creator, producer and subject of cinema provides a most intriguing perspective on North American Jewry. How are North American Jews presented, and by whom? 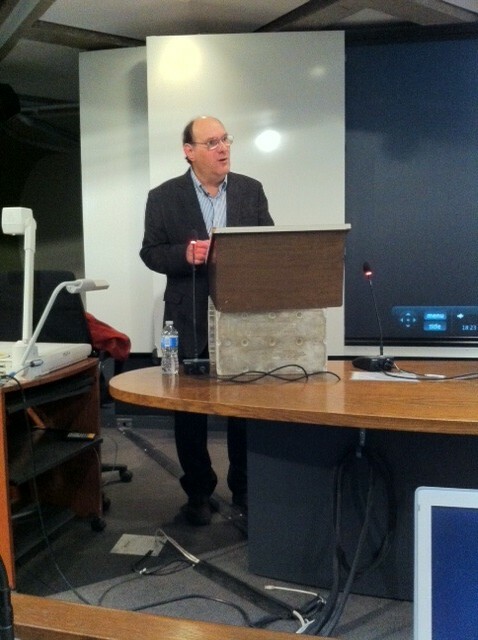 On March 22, the McGill Department of Jewish Studies had the pleasure and privilege of welcoming Dr. Eric Goldman, a distinguished expert and lecturer on Yiddish, Israeli, and Jewish film. Dr. Goldman has written extensively on the Jewish experience in film and has just completed a book about the American Jewish encounter with cinema, “The North American Jewish Story Through Cinema,” slated for publication in the coming months by the University of Texas Press. Dr. Goldman’s fascinating lecture covered a diverse range of topics, such as the historical background of early Hollywood, early movies depicting the North American Jewish experience, and the willingness or (more often than not) unwillingness of film company executives of the period to produce material with explicitly Jewish content. Such a stance was even taken by executives who were themselves Jewish. The reluctance on the part of the early 20th century American film industry to depict the experience of the American Jew changed as Hollywood grew, and American Jews rose in the social milieu. 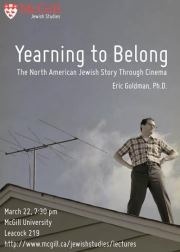 At a certain point in time during the development of American film, Dr. Goldman noted, film producers (both Jewish and non-Jewish) became more comfortable with portraying and “coding” the American Jewish experience. Such a development can be traced through some key films, and Dr. Goldman’s lecture focused on “The Jazz Singer” (1927), “Gentleman’s Agreement” (1947), “The Young Lions” (1958), “Avalon” (1990), and “Barney’s Version” (2011). All of these films depict the North American Jewish experience in unique ways, and the selection spoke to the great diversity of representational experience inherent in the vast corpus of North American film. 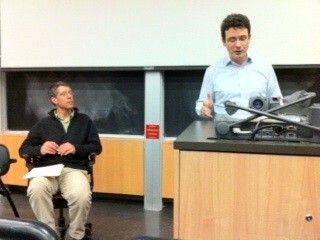 What a fantastic lecture and discussion! The McGill Jewish Studies Department would like to thank Dr. Goldman for his wealth of scholarly knowledge and graciousness. for information on upcoming events in McGill’s Department of Jewish Studies, visit us on Facebook! for information on the work of Dr. Goldman, visit his website. Published by iandavidbecker on April 2, 2012 at 6:48 pm under Uncategorized. 0 comments. 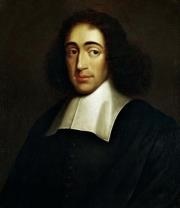 Baruch de Spinoza: Heretic or Hero? Religious Jews revile him as the arch-heretic while secular Jews, from Yiddish Socialists and Bundists to liberal Zionists have celebrated him for more than a century as a precursor and hero. Was he a heretic, a revolutionary, or simply trying to reform European Christendom? 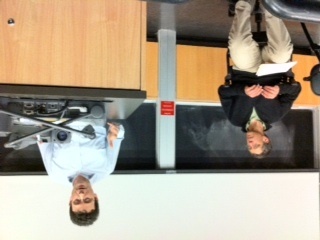 On March 15, McGill professors Carlos Fraenkel, Allan Nadler, and Professor Steven Nadler (visiting for the weekend from the University of Wisconsin at Madison), staged an open debate on the topic, putting forth three very distinct understandings of Spinoza’s ultimate role in Jewish history. For Professor Steven Nadler – the author of the recently published book “A Book Forged in Hell: Spinoza’s Scandalous Treatise and the Birth of the Secular Age” – Spinoza was the progenitor of secular modernity, and as such, can be said to be the first true secular Jew. "A Book Forged in Hell"
For Professor Allan Nadler, Spinoza’s place in the history of Judaism is very different. Citing various parts of Spinoza’s writings, Allan contended that Spinoza rejected Judaism entirely, and may have actually converted to Christianity. For Allan, Spinoza was assuredly not the first secular Jew, but rather a heretic who came to despise the religion of the Jewish community from which he was expelled. Allan gives his part of the lecture as Carlos and Steven observe. Professor Fraenkel, in a stark split from his colleagues, argued that Spinoza’s philosophy actually relies heavily on Medieval Jewish philosophy, and particularly the writings of Moses Maimonides (Rambam). Carlos speaks on Spinoza's Medieval influences. THE EVENT REMAINED PEACEFUL. No charems were issued. Attendants left with a strong desire to read Spinoza. But the debate continued the next day! Stay tuned for a filmed panel discussion in which Professors Nadler, Nadler, and Fraenkel provide summations of their various perspectives and argue their points further for the viewing public. Published by iandavidbecker on April 2, 2012 at 6:06 pm under Uncategorized. 1 comment. At a time when chronicling the Holocaust could not be a more pressing endeavor, when those concerned with cementing the history of such inconceivable atrocities are fully cognizant of the reality, fast approaching, in which the world will be bereft of witnesses and survivors able and willing to give first-hand accounts, it is hard to believe that the creation of the concept of the Holocaust was not concurrent with the Holocaust itself. In fact, the arduous, determined struggle on the part of those determined to impart the memory of the Holocaust to posterity took decades, and continues to this day. 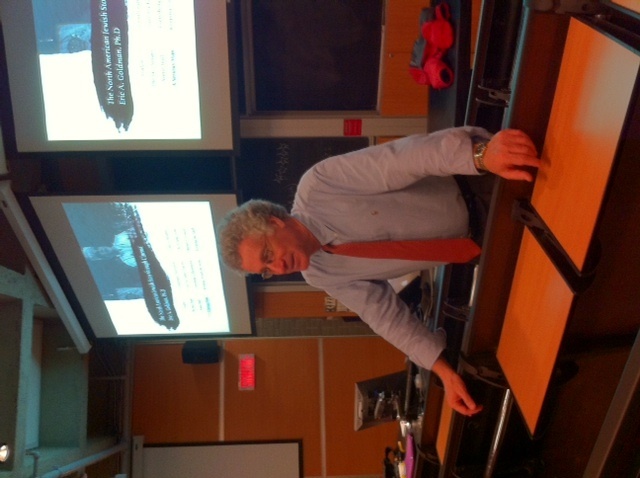 On March 14, Toronto-based filmmaker David Kaufman came to McGill and spoke about the many moral issues and creative challenges filmmakers face when they charge themselves with the task of the documenting the Holocaust. Mr. Kaufman began his lecture by giving a brief history of the Jewish cultural climate of Canada just before WWII and the reasons behind Canada’s involvement in the war. Mr. Kaufman also provided the attendees a background on Canada’s restrictionist immigration policies towards Jews during the war, and how such policies affected the discussion of the Holocaust in years directly following the end of WWII. David Kaufman explains a film clip. Mr. Kaufman explained that the narrative of the Holocaust emerged only gradually, through memoirs, artistic representation, and events such as the Eichmann trial. Slowly, Jews began to believe that they could safely discuss their personal traumas and tragedies, and much of this harrowing discourse took the form of literature, theatre, music, and other artistic media. Mr. Kaufman recounted his engagement as a young man with the theme of the Holocaust in various artistic forms, and his belief that much of the content was presented too much as “entertainment,” and that tragically, in the first decades following the Holocaust, the direct voice of the survivor was muted or sometimes even completely absent from such works. As the Holocaust receded from the immediate past, however, the tone and techniques of many works addressing the theme of the Holocaust changed. Mr. Kaufman spoke, for instance, about the 1955 documentary “Night and Fog,” by Alain Resnais, which contains graphic imagery of corpses and the interiors of Nazi death camps. The footage within this film, at the time of its release, was the dominant visual representation of the Holocaust. Yet, in Mr. Kaufman’s opinion, the film has very little to do with the actual experience of victims of these death camps, and seriously lacks political and historical content. Essentially, works like “Night and Fog,” while successful in making the public aware of the nature of the atrocities perpetrated by the Nazis, very much lacked the voices and perspectives of actual victims. Since the 1950’s, many films on the subject of the Holocaust have been made (Kaufman estimates the number at around 400), but unfortunately, many of these films similarly focus on horrific imagery, and not the experiences of survivors and affected communities. Over the past decade, Kaufman has labored to correct this unfortunate circumstance through a number of films, including “Night of the Reich’s Pogrom” (2001), “From Despair to Defiance: The Warsaw Ghetto Uprising” (2003), and “Song of the Lodz Ghetto” (2009). Kaufman described the difficulty he faced in finding much of the material for the films, as well as the intriguing origins of much of the footage. 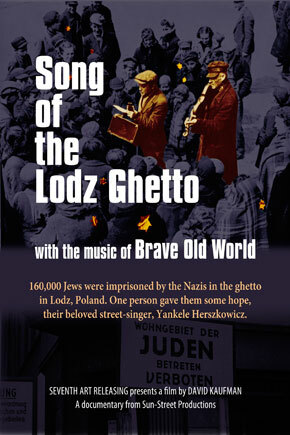 "Song of the Lodz Ghetto"
Some footage in “Night of the Reich’s Pogrom,” for example, was shot by a German firefighter – also an amateur filmmaker – who shot footage of burning synagogues that his brigade was prevented from extinguishing. The footage was shot during Kristallnacht. In fact, Kaufman said, a lot of accessible film footage and photographs actually come from Nazi photographers, a testament to the terrifying efficiency with which the gradual emptying of towns, cities, and ghettos was documented. Such documentation is integral for historians and artists attempting to build upon the unfinished record of the Holocaust. However, the origins of a lot of unearthed material remains unknown. Photographs taken by Nazis sometimes look no different from photographs taken by civilian Jews. Kaufman finished his lecture by describing the difficulty a documentary filmmaker faces when confronted with the question of what material to ultimately include in the final cut. To Kaufman, what matters above all else are the descriptions and memories of the actual survivors. In fact, he identifies this as his obligation to his films and his work in general. What one always must remember, Kaufman said, is that the Nazis believed that the awareness of their crimes would be kept with their victims. One of the great ironies of the era is that their own fastidious documentation of the events provides us with our basis for an increasingly true understanding of what transpired. Kaufman expressed that the attempt to chronicle the Holocaust is far from complete, and that now it is imperative that we do what we can to continue the effort. What drives him is the obligation that he feels to survivors and their families, and the immense gratitude of these people who have shared their pain and stories so that we may remember. 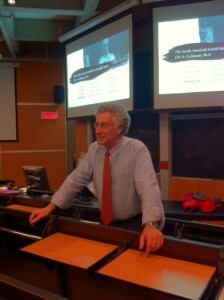 McGill Jewish Studies would like to thank Mr. Kaufman for such an enthralling and thought-provoking lecture. We look forward to his forthcoming work! for more information on Mr. David Kaufman, visit his website. for more information regarding upcoming events at McGill’s Department of Jewish Studies, visit us on Facebook! Published by iandavidbecker on April 2, 2012 at 4:59 pm under Uncategorized. 0 comments. 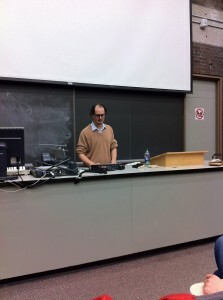 Socalled plays tracks from his sampler. 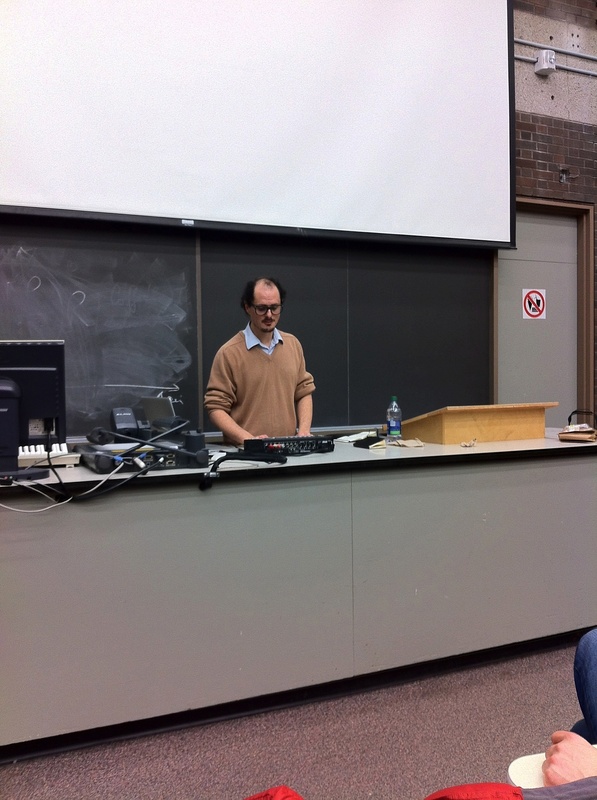 When I heard that the McGill Jewish Studies department had scheduled the Montréal rapper Socalled (aka Josh Dolgin) to come and give a lecture and performance, I had a vague idea of what to expect. After all, I am an avid fan of Socalled – I have his records, I watch his videos, and try to pay attention to what amounts to a career of unparalleled diversity and charming eccentricity. What I did not know, however, is that Socalled’s roots are extremely similar to my own. Like me, he studied Literature and Jewish studies at McGill. Like me, he did not come from a very religious background. His upbringing, to my surprise, was not as steeped in Yiddishkeit as I had initially believed. Much of Socalled’s presentation last Tuesday revolved around his process of familiarizing himself with the tragically disregarded genre of Yiddish theatre and Jewish cantorial recordings. He played records for the audience that he had unearthed in Montreal second-hand stores, vinyl that had, during the buzz surrounding the then “advanced” compact disc, been thrown out and left for dead and worthless. Josh explained, however, that the impetus for salvaging these records was not to “rescue” them from destruction. Rather, after stumbling upon a few records and getting a sense of the music, he could not deny that there was a unique and pronounced funkiness to the music – a musical quality that Josh explained he found similar to elements of rap, disco, hip-hop, and funk. Within this funkiness, the music also had a proclivity for “breaks” – quick showcases of specific rhythms, melodies, lyrics, or beats that could be isolated and turned into samples. To demonstrate the process of sampling “breaks,” Josh constructed the track “You are Never Alone” off of his 2006 album Ghettoblaster in front of the audience, which includes a “break” of a niggun that Josh isolated into a sample. The event lasted over two hours but went by in what seemed like minutes. I attended expecting to see Socalled, an artist that I revered, playing songs with which I would be mostly familiar. But the event was so much more than that. It was an honest and warm exploration of personal background and artistic inspiration, and of the way in which music is universally expressive, regardless of the specific social circumstances out of which it arises. Plus, I have now heard the phrase “Jewish Justin Bieber,” and I hope not for the last time. For more info on Socalled, you can find his website here. Published by iandavidbecker on February 13, 2012 at 5:56 pm under Uncategorized. 0 comments. 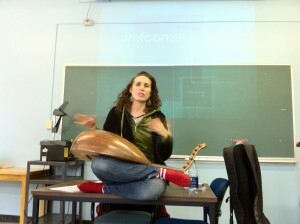 Basya Schechter with her prized oud. What an honor it was to have pan-ethnic musician, Basya Schechter, from Pharoah’s Daughter, come and speak to my ‘Mosaic of Jewish Music’ class last week. In front of a packed room in Wilson Hall, Basya immediately set an intimate and casual tone by sitting cross legged on a desk, introducing and playing her beloved oud. From that moment on, we lucky souls were quick to realize that we had just embarked on a very personal journey with one of today’s most unique artists in the American Jewish music scene. With a generosity of humor and grace, Basya shared her unique life story as she described her Hassidic origins and then her eventual embrace of the secular world. She spoke of her love of travel, (more precisely, hitch-hiking! ), as a conduit for her own exploration of music from Africa, Turkey, Bulgaria, India, Israel and North America. The songs she played for us from her CDs, sung in Yiddish, Aramaic, Ladino, Hebrew and English, were presented as tiny glimpses into her colorful vocal range, as well as her fascination for complex rhythms and lesser known non-western instruments. To listen to an interview with Basya conducted on CKUT’s “Shtetl on the Shortwave” program, click here. Published by iandavidbecker on February 7, 2012 at 5:11 pm under Uncategorized. 0 comments.